Six Briefing Papers on each ROSEnet European Policy Seminar, and therefore on the five different domains and multidimensional exclusion, will be published. Briefing Papers will be co-produced between researchers and policy stakeholders and will summarise analyses, key innovations, and recommendations for each exclusion domain. Briefing papers will also draw heavily on the work of the WGs. The sixth briefing paper, on multidimensional exclusion, will integrate findings across domains and across WGs. 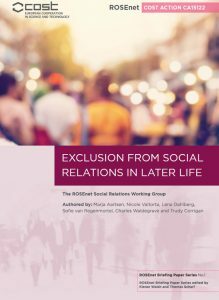 This first paper in the ROSEnet Briefing Paper Series focuses on ‘Exclusion from Social Relations in Later Life’. This Paper provide a summary of current insights on exclusion from social relations, identifying (some of the) knowledge gaps, and outlining opportunities for future policy to reduce exclusion from social relations among older adults. The paper is based on work of the members of the ROSEnet Social Relations Working Group, supplemented by presentations held at the 1st ROSEnet European Policy Seminar that took place in Oslo, March 9, 2017. Download paper here. The second paper in the ROSEnet Briefing Paper Series will focus on ‘Community and Spatial Aspects of Exclusion in Later Life’ and will be available from June 2018. The third paper in the ROSEnet Briefing Paper Series will focus on ‘Civic and Symbolic Aspects of Exclusion in Later Life’ and will be available from September 2018.